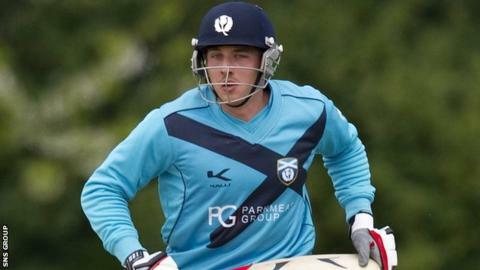 All-rounder Josh Davey earns a Scotland recall for the one-day international with England in Aberdeen on 9 May. The Somerset player was not involved in the successful World Cup qualifying campaign and is a replacement for the injured Richie Berrington. Seam bowler Alasdair Evans is also included, while Kyle Coetzer continues to captain the side. New head coach Grant Bradburn will be a spectator at Mannofield, with Craig Wright taking charge of the team. Wright, who helped steer the Scots to victory in the qualifying tournament for next year's World Cup along with Paul Collingwood, will assist the New Zealander when he takes up the post on 1 July. "The match against England is a wonderful opportunity for us to continue the progress which the team made in New Zealand earlier this year," said Wright. "The challenge for us, regardless of the opposition, is to continue to display the strong, positive mentality which was the cornerstone of our recent success. "With the World Cup to look forward to in under a year, this game will be a great chance for us to test ourselves at the type of level we want to be successful at moving forward. I hope the occasion is a memorable one for Scottish cricket." England have named a strong squad, with pace bowler James Anderson back and Alastair Cook leading the visitors. Scotland will be in the same group as England at the World Cup, alongside co-hosts Australia and New Zealand, Bangladesh and Sri Lanka. Scotland ODI squad v England: Kyle Coetzer (capt), Freddie Coleman, Matthew Cross, Josh Davey, Alasdair Evans, Majid Haq, Michael Leask, Matt Machan, Calum MacLeod, Preston Mommsen, Safyaan Sharif, Rob Taylor, Iain Wardlaw.